Get your FREE Sample issue of Making Cards & Papercraft today! 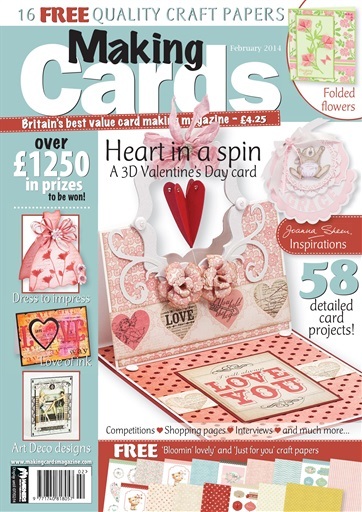 (1 Customer Reviews) | Write Review 13 issues per year Making Cards & Papercraft, is a 13 issue magazine which remains the UK’s best value card making magazine, making it the premier choice for enthusiasts who demand the full diversity of their chosen subject. 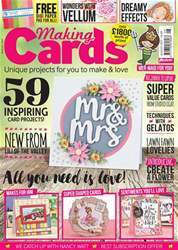 Each issue is packed full of detailed step-by-step card projects created by a team of highly talented contributors demonstrating a vast array of techniques to bring you a wide range of beautiful projects that are unique to Making Cards & Papercraft readers. All this teamed with competitions galore, friendly interviews, celebrity crafters, reader letters and shopping pages showcasing the newest products makes Making Cards one not to miss! Plus, 16 FREE downloadable craft papers with every issue. Make sure that every single one of your designs is a show stopper with Making Cards & Papercraft magazine! This month we’re all about love! Not just love for the other half in your life but love for everything. Love for friends, family, hobbies, card making! Joanna Sheen talks about her love for her new granddaughter in her Inspirations piece and share’s a special photo of them both while in 5 Mins with we talk about a love for crafting with Sarah from craft shop Stamp Addicts. The two sets of free craft papers provided for you (included as a downloadable PDF) with your February edition have a generic love theme. Just for you features an ever-so cute and beautifully illustrated teddy bear with offerings such as hearts and flowers that can be used on cards for all those special to you. Bloomin’ lovely, again has a love theme hidden in pretty pastel coloured hearts and birds and again some cute teddy bears. Emma and Jenny have excelled themselves yet again transforming these designs into a beautiful set of cards for you to recreate. For something a little bit different we’re aiming to bring you an interesting shaped card each month – in this edition Tracy Evans has created some cute little dress shaped cards in Dress to impress, a die-cut card you can decorate as pretty as you wish. Elsewhere in One stencil three ways Tracy has cleverly created three different cards using the same stencil but with different effects - a great project for those saving the pennies in the New Year. Likewise, the same stamp has been used in Kitty’s Re-use and re-design with fantastic and varied results. If folding is your thing then why not try having a go at Wendy Martin’s Folded flowers, a super 3D project that folds flat for the all-important postage costs or send someone in a spin by presenting them with Emma Williams’ Heart in a spin project – another project that will fit nicely in an envelope but then open up to reveal moving parts. Making Cards & Papercraft, is a 13 issue magazine which remains the UK’s best value card making magazine, making it the premier choice for enthusiasts who demand the full diversity of their chosen subject. You'll receive 13 issues during a 1 year Making Cards & Papercraft magazine subscription. You'll receive 13 issues during a 1 year Making Cards & Papercraft magazine print subscription.